I’m having one of those days when nothing goes to plan, but maybe that’s not all bad. My cleaner has just come and she’s in agony with tennis elbow, with pain an swelling going all the way down the outside of her forearm (the wrist extensor muscles). I’ve just spent a quick few minutes at the end of her shift doing some myofascial release, gently massaging in my Nerve Magic oil and have given her an exercise to do. She says she can feel some release already and has booked a full session. Here’s hoping we can make progress together and free up her much-needed arm.! 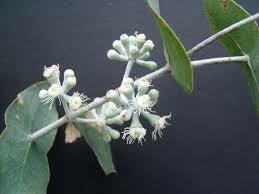 Here’s a picture of Eucalyptus staigeriana; it’s essential oil is deliciously lemon-scented, is great for nerve pain and inflammation and is a key ingredient in my Nerve Magic blend.